The topic of the conference are broadly understood issues of contemporary protection of historic ruins and historical conditions of these activities. This difficult subject has always been present in the reflection on art and in the protection of monuments. At individual stages of the development of these disciplines, the successive generations of art lovers and conservators have tried to determine the place of ruins in cultural heritage and to look for ways to protect these sites.External conditions have changed radically, but there has always been the dominant view that historic ruin - a ruined object shaped in the long-term destruction process, is an outright monument and should be protected.Still, there have also emerged the concepts to rebuild the ruins to give them the forms of objects to which utility functions can be introduced.Such tendencies, significant in the modern era, have intensified again in recent decades, favoured by non-conservationconditions - technical, economic, organizational, ownership, social and cultural.As a consequence, the reconstruction of ruins is becoming more and more common across Europe and conservators have to face this problem again.In the past, many conferences were organised and many publications were issuedon the topic of historic ruins.These works intensified in Central Europe after the political transformation started in 1989, when the new economic, social and political situation created wide opportunities and threats in the utilisation of historic ruins.Environmental discussions, research programs, conferences and publications led, among others, to development of a program document entitled Historic Ruins Protection Charterin 2009. This document clearly indicates that the proper form of protection of historic ruins is their maintenance in the form of so-called permanent ruins. However, the ideas, projects and implementations involving the reconstruction of historic ruins still do not peter away.This is very disturbing because, according to estimates of medieval ruins - which are the most valuable part of this resource - in all the countries there are not many such objects.Many managers, however, are still not aware of the value of ruins, the ideas and resources for their maintenance and use.So, if the investors come up proposing the development of the ruins through their reconstruction, such ideas gain support and they are implemented.Therefore, the duty of conservation circles is to develop principles for the protection of historic ruins and patterns of contemporary utilisation, use and management of the so-called permanent ruins. Most of all, the owners and managers decide about the way of dealing with historic ruins. They need to be provided with comprehensive information on the importance of ruins, forms of their protection, management methods and opportunities for their utilisation. Collecting this information should be based on analysis of the best examples of contemporary protection and management of historic ruins.Discussion and examples of ruins’ management should be of international character, as the problems of protection and management of ruins are similar in many countries. The aim of the conference is to make a broad review of the problems related to the protection, conservation, use and management of historic ruins. 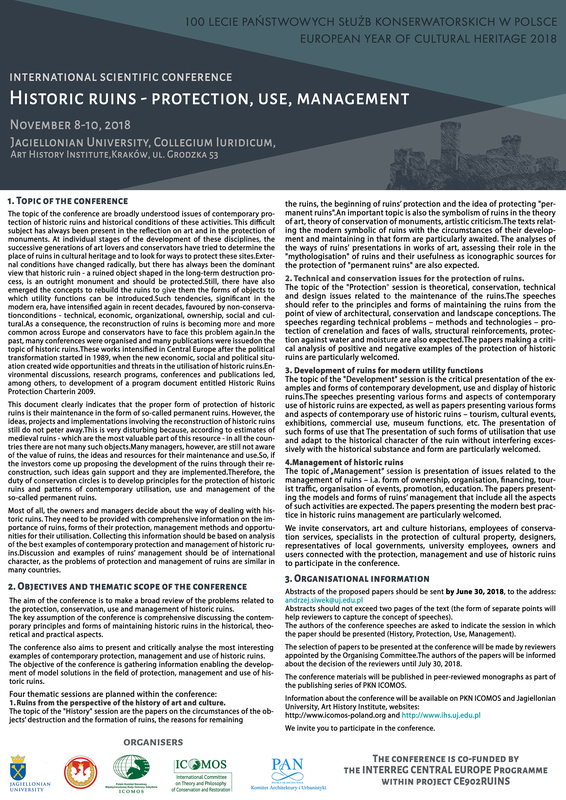 The key assumption of the conference is comprehensive discussing the contemporary principles and forms of maintaining historic ruins in the historical, theoretical and practical aspects. The conference also aims to present and critically analyse the most interesting examples of contemporary protection, management and use of historic ruins. The objective of the conference is gathering information enabling the development of model solutions in the field of protection, management and use of historic ruins. 1. Ruins from the perspective of the history of art and culture. The topic of the "History" session are the papers on the circumstances of the objects’ destruction and the formation of ruins, the reasons for remaining the ruins, the beginning of ruins’ protection and the idea of protecting "permanent ruins".An important topic is also the symbolism of ruins in the theory of art, theory of conservation of monuments, artistic criticism.The texts relating the modern symbolic of ruins with the circumstances of their development and maintaining in that form are particularly awaited. The analyses of the ways of ruins' presentations in works of art, assessing their role in the "mythologisation" of ruins and their usefulness as iconographic sources for the protection of "permanent ruins" are also expected. 2. Technical and conservation issues for the protection of ruins. The topic of the "Protection" session is theoretical, conservation, technical and design issues related to the maintenance of the ruins.The speeches should refer to the principles and forms of maintaining the ruins from the point of view of architectural, conservation and landscape conceptions. The speeches regarding technical problems – methods and technologies – protection of crenelation and faces of walls, structural reinforcements, protection against water and moisture are also expected.The papers making a critical analysis of positive and negative examples of the protection of historic ruins are particularly welcomed. The topic of the "Development" session is the critical presentation of the examples and forms of contemporary development, use and display of historic ruins.The speeches presenting various forms and aspects of contemporary use of historic ruins are expected, as well as papers presenting various forms and aspects of contemporary use of historic ruins – tourism, cultural events, exhibitions, commercial use, museum functions, etc. The presentation of such forms of use that The presentation of such forms of utilisation that use and adapt to the historical character of the ruin without interfering excessively with the historical substance and form are particularly welcomed. The topic of „Management” session is presentation of issues related to the management of ruins – i.a. form of ownership, organisation, financing, tourist traffic, organisation of events, promotion, education. The papers presenting the models and forms of ruins’ management that include all the aspects of such activities are expected. The papers presenting the modern best practice in historic ruins management are particularly welcomed. We invite conservators, art and culture historians, employees of conservation services, specialists in the protection of cultural property, designers, representatives of local governments, university employees, owners and users connected with the protection, management and use of historic ruins to participate in the conference. Abstracts should not exceed two pages of the text (the form of separate points will help reviewers to capture the concept of speeches). The authors of the conference speeches are asked to indicate the session in which the paper should be presented (History, Protection, Use, Management). The selection of papers to be presented at the conference will be made by reviewers appointed by the Organising Committee.The authors of the papers will be informed about the decision of the reviewers until July 30, 2018. The conference materials will be published in peer-reviewed monographs as part of the publishing series of PKN ICOMOS. We invite you to submit proposals for conference presentations. We invite you to participate in the conference.